Sushi and summer rolls are a great way to take a small amount of leftover protein, some farm fresh veggies, and a carb like rice or rice noodles to make a quick, interestingly packaged snack or appetizer. My family loves to eat something so visually appealing and it comes together super quickly if your pantry is stocked. We eat rice a lot, so I always make a full pot in my 3 cup version of this rice cooker (the 3 cup size is great for our family, therefore 95% of my rice cooking needs. It makes no sense to me to buy a giant rice cooker for the handful of times a year I need to cook more than for us). We never finish the pot, however, so I wrap up the extra rice in single serving patties and save it in the freezer. That way, I nearly always have cooked rice on hand. 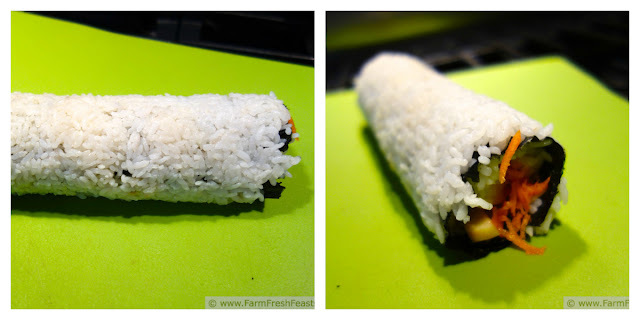 With leftover rice, this rolls up fast and easy. Get it? Rolls up? Back to the sushi, Kirsten. I had a bit of salmon left over from this dip, and carrots, but right now I'm waiting for the CSA season to start and I had no cucumber or kohlrabi for crunch. I like a bit of crunch to my sushi, don't you? Looking through the crisper, I decided to try apple slices. Why not? I admit the thought crossed my mind that, if it worked, this could be a candidate for Laura at Sprint 2 the Table's weekly Strange But Good party. I'd baked the salmon very plainly, with only a bit of Pampered Chef dill mix as seasoning. That left it a blank canvas, so I mixed up a maple-teriyaki dressing which paired nicely with all 3 elements. Combine salmon, maple syrup, and teriyaki sauce in a small bowl, set aside. Place the sheet of nori on your rolling-up-sushi device (my daughter convinced me to get this pink thing, and I am torn between it and my Old Bamboo). 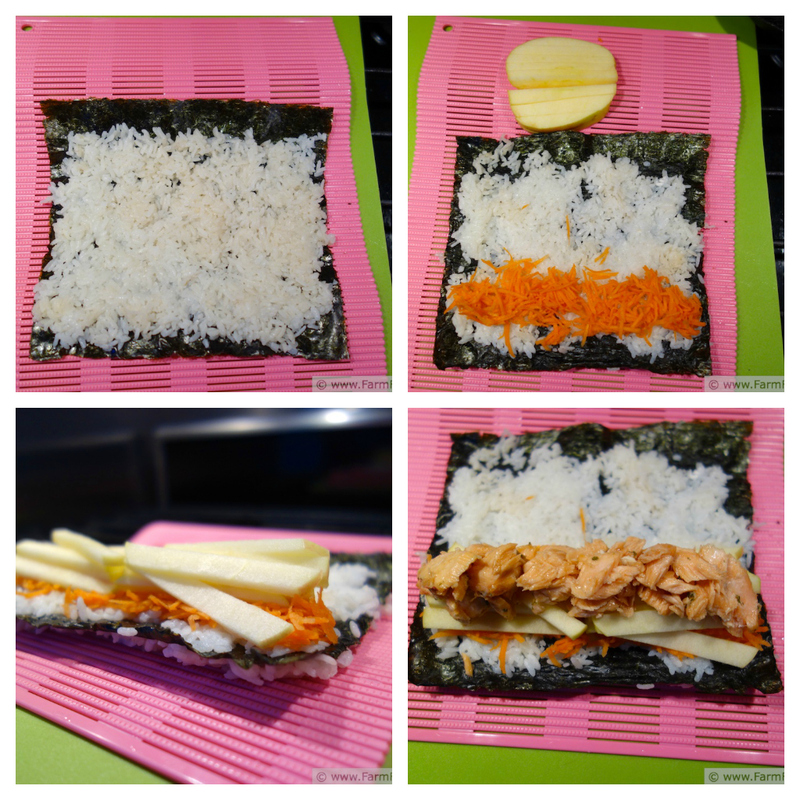 Dip your fingers in water, and spread about half of the rice across the nori in as even a layer as you can make it. This will be the outside, so make it look pretty. Wet fingers are much easier for this task. Like an oiled piece of parchment for pizza . 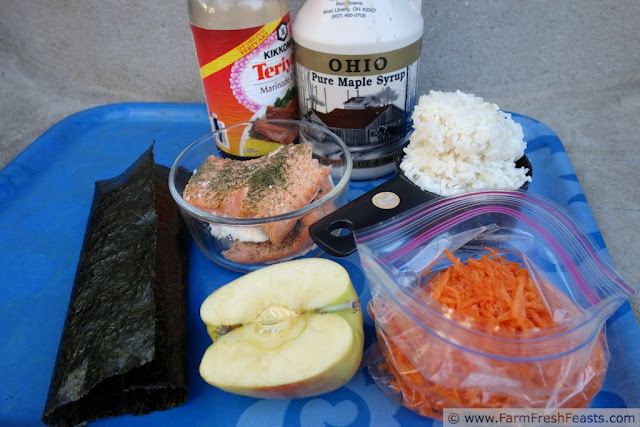 . .
Flip the rice-coated nori over and repeat on the other side with the rest of the rice. This is now the inside of your roll, and who cares if it's not perfect? An apprentice sushi chef, that's who. Since there are no apprentice sushi chefs in the house I let it go. Spread a layer of shredded carrot across the edge of rice closest to you. Top with a layer of apple sticks. Cover with the salmon (don't worry if your family walks by snagging bites of salmon--there's plenty left for this roll). Pick up your rolling device and tightly roll away from you, stopping once you've made your first revolution to pull the rolling device away so it doesn't get rolled up with the food. Give it a squeeze when you're finished rolling. Slice into 8 pieces with a serrated knife (wiping the blade with a wet paper towel in between cuts really helps). Serve with a drizzle of maple teriyaki sauce or a splash of soy sauce. It was very tasty. If I'd had more salmon I could have eaten more sushi, then again, I can eat my age in pieces of sushi. Kirsten, the sushi looks beautiful, and the flavor combo sounds great! What a fantastic way to use leftovers. I appreciate your kind words--thanks! Kirsten: Your sushi is to die for. I have never attempted to make my own. I like to leave some things to the experts. What time should I arrive to consume your next batch of sushi? Now that it's the 3 of us, I'll be serving unagi for dinner one of these nights (2/3 of us LOVE it, and the other one can fend for herself). So, 6ish? Yum! This looks delicious. I appreciate that the salmon is cooked because I'm not a raw fish kind of gal. I bet my kids would eat this, so I'll file it away for when I have leftover salmon. 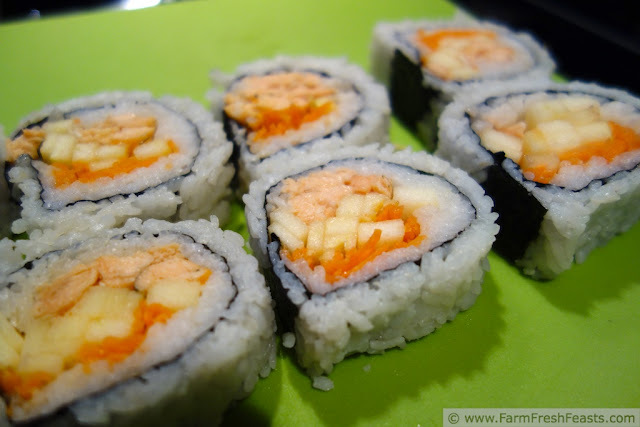 I am a raw fish kind of gal (except for sea urchin) but I also love fish cooked, so anything goes in my sushi. I freely admit that the combination of having half an apple sitting there, and knowing Laura's strange but good party inspired this combination--but it's a keeper and I'll make it again. This sounds great, Kirsten! I'm vegetarian, but I could substitute something for the turkey. Thanks for sharing! Ohhhh... what a perfectly #strangebutgood roll!!! I love salmon with fruit, and carrots are my favorite veggie. Awesome idea!!! Very nice! I love apples and carrots together. This looks refreshing and spring-y. Thanks! 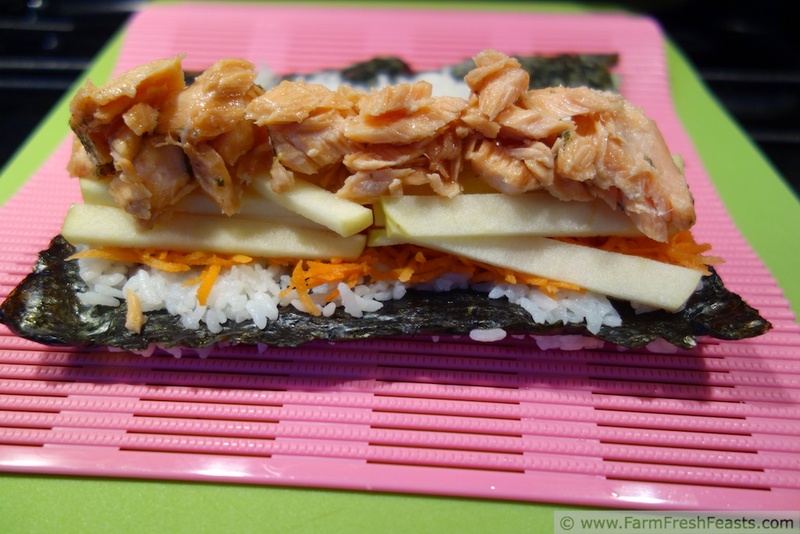 Salmon, maple and apple sound like they would be heavenly together! I can just imagine the (strange but good) flavor combo--plus apple crispy-crunch in sushi! I'm pretty terrible at rolling sushi, but I bet I could make a delicious deconstructed/salad version with those ingredients. I have no idea why I cannot reply to each comment, but anyway--Frances, great idea to sub for the fish. I look forward to my CSA starting back up, because I will have all sorts of veggies to combine in a roll. And since I'm trying to add more avocado to my life in 2013, I'll throw them in too. Laura, Thank YOU for inspiring me with your strange but good party! Sarah, I'm glad you think it's spring-y. I agree, which is why I've been sitting on it for a few months, waiting for stew weather to end. Allie, I bet this would make a great Chirashi or scattered sushi. Please let me know if you give it a go. Thanks for stopping by! Coolest post ever! Sushi? Really? Is there anything you can't do? I can't dust. Well, perhaps more correctly I don't want to dust. Or weed whack, I don't like doing that either. But sushi? I took one of those Learning Annex classes back in the 80s to learn how to make sushi, then I've been blessed to know creative cooks all over the place who used different ingredients and made sushi for me. In Japan, during the "Get To Know The Host Country" class on base, we watched sushi being made with, and I am not making this up, pickles and hot dogs. I'm guessing they went with the lowest common denominator that they thought the Americans would eat? I love a new recipe and this one is sure a saver........Thank you for sharing with the Clever Chicks Blog Hop this week; I hope you’ll join us again! I love the concept of rolling whatever into sushi, and that concept is definitely a keeper. G'day! Always enjoy viewing something unique, TRUE! i could go for some of this now too! I also enjoy seeing new things--it's pretty cool how the internet can bring the world's eats onto my porch for me to see. Those rolls look delicious! Thank you for sharing with the Clever Chicks Blog Hop this week! I would love to make my own sushi and this sounds like a great recipe! Thanks for sharing on Foodie Friends Friday! Once you get some tools, it's really easy to whip out some rolls on a whim. Please let me know if you try it! YES! I'm so glad you mentioned the "Crunch factor" when it comes to sushi. My main aversion to sushi is the softness of it. I have a texture issue and if they don't line up in all the right ways, I can be a bit finicky. I've never made my own but would love to. I like your cute rolling mats! I've picked up a jar of sesame seeds and ginger seasoning blend that will be terrific for adding that crunch factor to sushi. I just need to remember to use it!